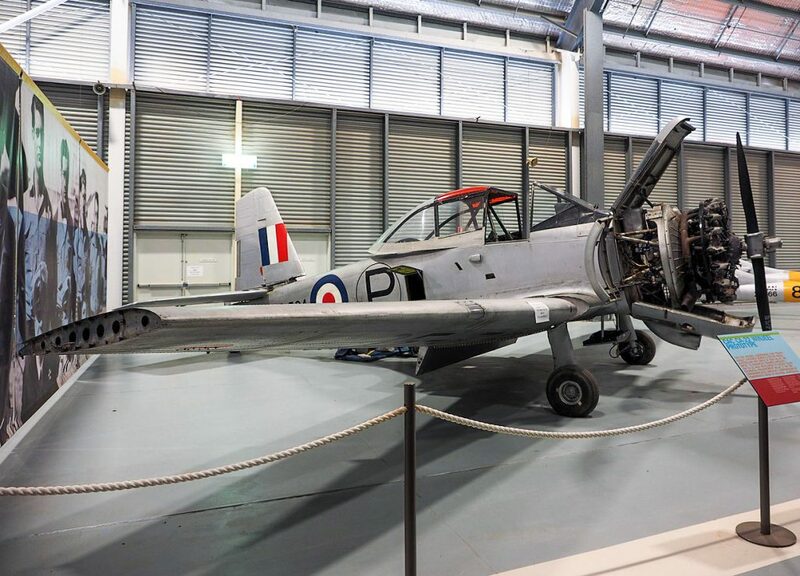 In the early 1950s, the Commonwealth Aircraft Corporation (CAC) at Fishermans Bend in Victoria, Australia designed a new trainer for the Royal Australian Air Force to replace its aged WWII-era deHavilland Tiger Moth and CAC Wirraway fleets. The resulting aircraft was a robust and reliable piston-powered design named the CA-25 Winjeel. ‘Winjeel’ is derived from an Aboriginal word for ‘young eagle’. The prototype Winjeel, RAAF serial A85-364, was actually designated as the CA-22. It flew for the first time on February 2nd, 1951. Initial testing revealed a few design flaws, but also that it was too stable and therefore not challenging enough for trainee pilots. CAC modified the design, which included enlarging the tail fin and shifting it forwards 38″ while also moving the engine forwards by 7″. After proving the updated design, re-dubbed the CA-25, the first production aircraft, A85-401, took to the skies on February 23rd, 1955. After flight testing, the RAAF deemed it a success and began accepting the aircraft into service that August. The Winjeel has a wing span of 38 ft 7 1⁄2 in (11.78 m) and a length of 29 ft 1⁄2 in (8.55 m), and an empty weight of 3,573 lb (1,595 kg). When loaded with two crew and fuel, it had a maximum take-off weight of 4673 lb (2,086 kg). 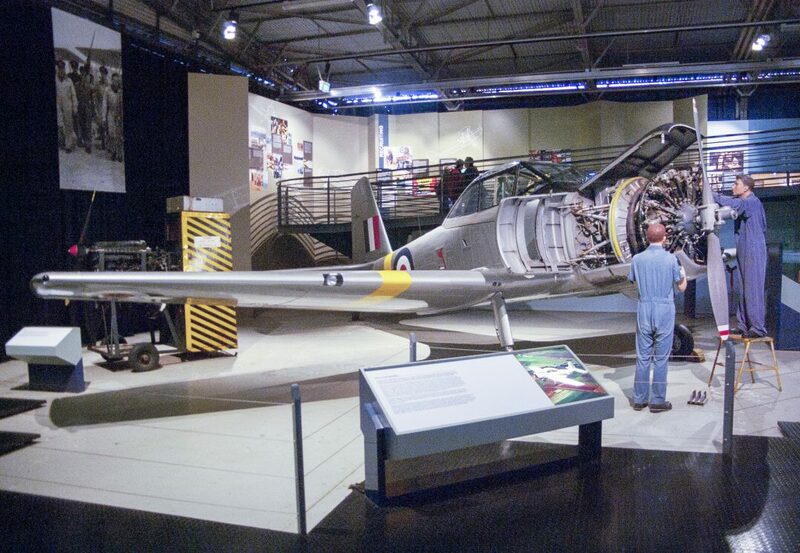 The Winjeel had a 450hp Pratt & Whitney R-985 Wasp Junior engine up front which gave the aircraft an initial climb rate of 1,500 ft/min (457 m/min), a cruising speed of 134 knots (254 kph), and a maximum speed of 162 knots (301 km/h). Its service ceiling topped out at an impressive 15,800 ft (4816 m). while it had a satisfactory range of 477 nautical miles (885 km) on its internal fuel. During the type’s long service career, RAAF Winjeels trained pilots across all three Australian military services – Air Force, Army and Navy. Winjeels were a frequent sight in Victorian skies at RAAF bases East Sale and Point Cook. By the 1970s, Winjeels were were showing their age, and the RAAF was also now planning for a new, all-jet training syllabus. 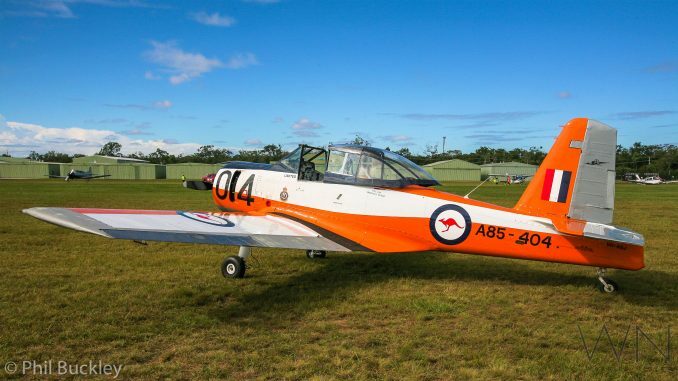 However, the RAAF discovered their ideas for an all-jet training proposal unsatisfactory and instead opted to purchase the New Zealand-designed CT/4A Airtrainer for its basic pilot training fleet. Curiously, despite most of the Winjeel fleet entering retirement in the 1970s, the RAAF kept some of them for use as Forward Air Controller aircraft, or FACs. Unsurprisingly, these FAC-birds wore a camoflauge scheme instead of the types more typical training colors. They would mark ground targets with smoke bombs. These type served in this role until its final retirement from RAAF service with the standing down of 76 Squadron’s remaining 14 examples at Williamtown in 1994. Winjeel A85-404 rolled off the CAC production line in Melbourne. The RAAF accepted her for service at No. 1 Aircraft Depot (1 AD) in Laverton during October 1955. That November 1955 the Winjeel received an assignment to RAAF base East Sale, Victoria. In April 1956, ‘404 moved to No. 1 Basic Flying Training School (1 BFTS) at RAAF Uranquinty in New South Wales. She then moved in November, 1958 to RAAF Base Point Cook, Victoria. In January 1959 the trainer joined 22 Squadron at RAAF Base Richmond. By January 1960 she transferred to 2 AD, also at Richmond. After a few more months ‘404 joined 34 Squadron at RAAF Fairbairn, near Canberra. The Winjeel remained with 34 Squadron until mid-1964 when she moved back to 1 BFTS, and then again to RAAF Base East Sale. By 1967 ‘404 went to the Airframe Repair Workshops (ARW) at Parafield in Adelaide, South Australia. She rejoined 1 BFTS following overhaul and remained there until withdrawn from service and put up for public tender in December, 1977. At the close of her RAAF career, A85-404 had clocked up a respectable 4,234 hours of logged flight time. Read the rest of the article at Warbirdnews.com.